Although we sometimes think of collagen as a substance synonymous with Botox and lip injections, it has recently become one of the most popular supplements to support healthy looking skin and healthy aging. Many people are choosing drinkable collagen supplements, trying collagen chews, or using topical products made with collagen peptides. The most abundant protein in the body, collagen is found in your bones, muscles, skin, digestive system, blood, and tendons. Collagen is what gives structure to our skin, hair, nails, ligaments, and tendons, and supports flexibility and elasticity, and may give you the “glow” that comes with healthy skin. Collagen is also thought to support healthy aging, particularly for women, although many men choose to support their health with collagen as well. Our bodies naturally produce collagen, but during the aging process this production begins to slow. The process of losing collagen often begins in your mid-twenties, and women in particular lose roughly 1% a year, ending with a 30%-50% drop postmenopause. This often contributes to thinner skin that is prone to drying and sagging. People also experience joint issues and general pain that is the result of weak or decreased cartilage. However, for the past few years, researchers have begun to conduct studies on the effects of collagen supplementation to combat these issues. Before choosing a collagen supplement to support your health and promote healthy collagen levels, it’s important to understand collagen’s role in your body’s overall function, as well as the kinds of collagen that make up your skin, fluids, and organs. Collagen is the most plentiful protein in animals. It plays a role in structural support and contributes to the organization and shape of tissues, and also interacts with other cells via receptors. Collagen’s molecular structure was first discovered in the mid-1930s by scientists Crick, Pauling, Rich, and Yonath, who later became Nobel laureates. In 1969, Type II collagen was discovered, and since then over 26 types of collagen have been identified, bringing the number of collagen types to 28. The structure of collagen is called the “Madras” model, which is a triple-helical structure. Collagen makes up about 30% of the protein in our bodies, and about 70% of the protein in our skin. Like most proteins, collagen is made up of long-chain amino acids, specifically amino acids like glycine, proline, hydroxyproline, and arginine. Glycine, the amino acid found in the highest levels in collagen, may also offer support for healthy metabolic processes. Proline, a nonessential amino acid, is synthesized from glycine and supports healthy joint and tendon function. Hydroxyproline works to support collagen stability. Arginine works to support healthy nitric oxide breakdown and promotes healthy circulation. The most common types of collagen are Type I, Type II, and Type III. Type I collagen is the most abundant type of collagen in the body — it is found in the skin, tendons, ligaments, organs, and bones, and is even found in the gastrointestinal system. It works to support skin elasticity and may support wound healing. It is also present in scar tissue. Type II collagen makes up the fluids in your joints, and is responsible for cartilage production, which is essential for supporting joint health. It makes up about 50-60% of the protein in cartilage and 85-90% of collagen in articular cartilage. Type III collagen is often found with type I, and it is found in skin and organ cells. It works to support healthy looking skin, hair, and nails, and promotes muscle and bone health. In an early study of Type III collagen, researchers discovered it may also offer potential health benefits for cardiovascular health. Over 90% of the body is composed of collagen types I and III. Collagen I and III are produced from fibroblasts (the cells in your connective tissues) and osteoblasts (the cells that make bones). Collagen Type II is produced by chondrocytes, which is a liquid-like filling in the cartilage (also called the non-cellular matrix of cartilage). Why Take a Collagen Supplement? There are a number of reasons to take a cartilage supplement. Although our bodies may have adequate levels of collagen in our early years, production slows dramatically as we age. During the aging process, collagen fibers begin to break down or stop regenerating. This can lead to a “deflating” effect on the skin, where it may appear thin, yellow, or dry. Type II collagen also breaks down as we age, but its effects may be less noticeable. Although collagen is made from protein and vitamin C obtained through our diet, we often lose collagen at a greater rate than our bodies produce new cells. By the age of 40, the body’s ability to produce collagen will likely decrease by around 25%, and often decreases by over 50% by age 60. In addition to its effect on skin health, collagen may also break down in the fluid between the joints, which can cause a number of health issues. It is also suggested that a collagen supplement may support a healthy weight and promote a healthy metabolism. Depending on what your health goals are, you may choose either a Type I and III collagen supplement, or a Type II supplement. 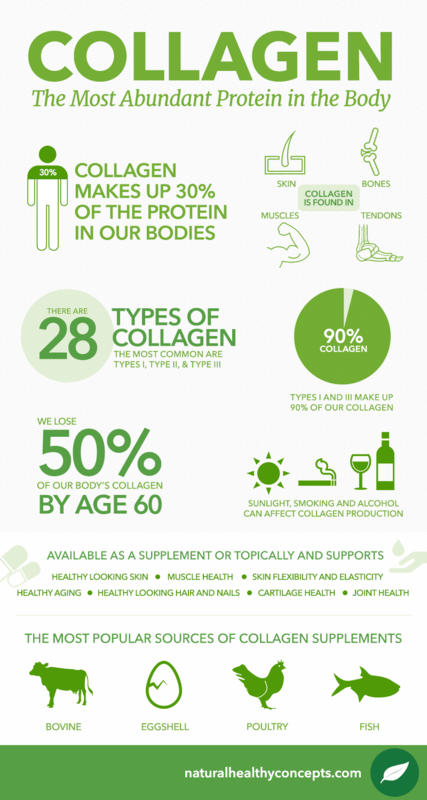 Although research is ongoing, it seems clear that adding a collagen supplement could make a difference to your health. However, a simple search for “collagen supplement” yields hundreds of hits. How can you choose the best collagen supplement to support your health? There are a number of collagen supplements available, both ingestible and topical. One of the important factors to consider when choosing a collagen supplement is if the supplement contains hydrolyzed collagen. Hydrolyzed collagen is composed of smaller molecules and has a lighter weight, which is thought to support absorption and bioavailability. Unlike other collagen supplements, hydrolyzed collagen is easily dissolved in liquids, making it a popular choice for powdered collagen supplements. Collagen supplements are sometimes referred to as collagen peptides, although some manufacturers may list it as hydrolyzed collagen peptides. The word “peptide” refers to when the collagen is broken down into shorter chain amino acids that are thought to be more easily absorbed and used in the body. In addition to supporting healthy looking skin, hair, and nails and promoting joint health, hydrolyzed collagen may support healthy energy levels, bone health, bladder health, circulatory health, and may promote healthy blood pressure levels already in the normal range. If you’re looking to choose a collagen supplement, you can choose from a number of sources. The most common collagen supplements come from bovine, poultry, fish, and eggshell membrane sources. Bovine collagen is one of the most popular collagen supplements. Derived from cow bones, skin, and muscles, this collagen contains mostly collagen Types I and III. It is often used to support muscle health and supports the production of creatine. Creatine is produced from amino acids and is used to create ATP, which is your body’s energy source. It is thought that bovine collagen may also support your health after a workout. Most Type II collagen supplements are derived from chicken collagen. As a result, it is used to support healthy cartilage production and may support joint health. Chicken collagen may also contain chondroitin sulfate and glucosamine sulfate, which may work to support healthy aging. Fish collagen is another popular supplement as is it is thought to be easily absorbed and used in the body. It contains mostly Type I collagen, which works to support healthy looking skin, joint health, muscle health, and more. This type of collagen is also used to support healthy aging. Eggshell membrane collagen is one of the newer collagen sources, and is ideal for ovo-lacto vegetarians. As the name suggests, this type of collagen is found in the shells, membranes, and whites of eggs. It contains collagens Type I, IV, and X, but Type I is the most abundant. It is often taken to support joint health and connective tissue health. You may also choose to add other supplements to your collagen routine, such as vitamin C and manganese to support collagen health, promote overall health, and fill in any nutritional gaps. There are a number of topical products available today that contain collagen and claim to support healthier looking skin, but many people believe that these products are less effective because the molecules in the collagen are too large to be easily absorbed into your skin. While in general this may be true, there is some evidence that suggests applying collagen peptides to your skin may offer support for healthy aging and may support a healthy skin appearance. In one study, women who were given a topical collagen peptide formula experienced a number of positive effects on overall skin health. Researchers stated, “The results from this study demonstrate that this uniquely formulated line treatment was well tolerated and provided both immediate and long-term improvements in the appearance of fine and coarse wrinkles.” While studies into exactly how topical collagen solutions support healthy looking skin are ongoing, these products may be somewhat effective for some individuals, although they may lack results beyond the superficial. Overall, research seems to indicate that if you’re looking for the best support, you may want to choose an ingestible collagen supplement, which may have potential benefits beyond supporting healthy looking skin. If you’re looking to branch out into the world of collagen supplements, we offer a number of options here at Natural Healthy Concepts including ingestible collagen and topical formulas that contain collagen. No matter your health needs, you’re sure to find something you love here at Natural Healthy Concepts!